We had a good early morning bite today up north. 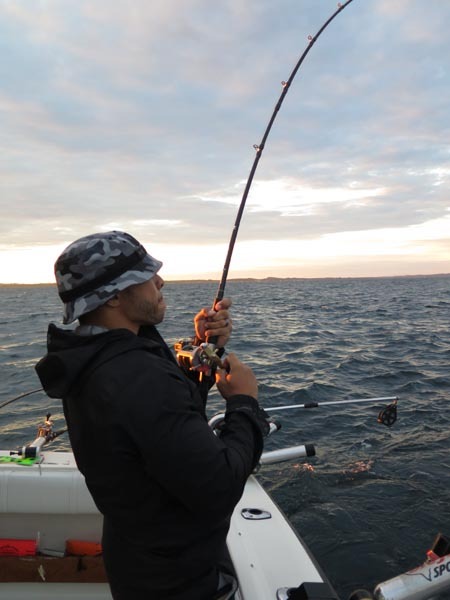 First rod to go was a high wire diver out 130 with a 10′ Blue Bubble Spin Doctor/Blue Fairways Strong Fly. A 200 copper with a Natural Glow Dreamweaver Captain’s Choice Cut Plug went next. While we were fighting those 2 we missed a King on a low wire diver out 110 with a 10″ Glow Blade Spin Doctor/Green Mirage Strong Fly. We hit another King on a 250 copper on a Pearl Zebra Captain’s Choice Plug. We got one of the fish in and then the low wire went again with the 10″ Glow Blade/Green Mirage Strong Fly. We ended up getting all those Kings in the boat then a 175 copper with a Natural Glow Captains Choice Cut Plug took a nice Lake Trout. Just north of the Point the 175 copper with the Natural Glow Plug took a big Steelhead. Boat traffic was heavy again today. When we turned back south and headed southwest for deeper water. We took 2 Kings and 2 Lakers out there. Both the Kings came on a 300 copper with a 10″ Chrome Killer Spin Doctor/Green Gasoline Dreamweaver Meat Rig. Both the Lakers came on a tin can dodger/Green Chartreuse Spin-N-Glo. We use Dreamweaver Premium Strips in all our meat rigs and Morgan’s Tackle copper on all our copper rods. 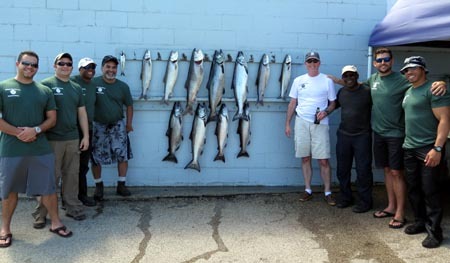 We fished north of Ludington today. We had a 2 boat charter with Hiatus Charters. Our group was delayed this morning and we didn’t get away from the dock until 5:45. No early morning bite for us. We had all our rods set when the chute rigger with a 11″ White Crush Paddle / Pickled Sunshine Action Fly took a vicious hit. It was the 23.78 lb. King pictured below. It took about 30 minutes land that fish. Next King came on a high wire diver out 135 with a 10″ Blue Bubble Spin Doctor/Blue Fairways Strong Fly. There was heavy boat traffic north today. 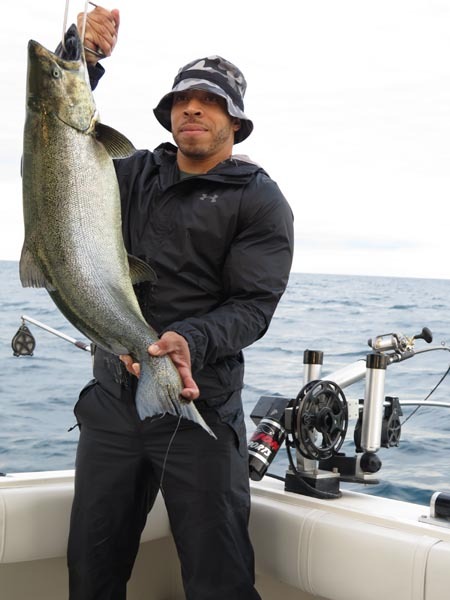 We headed out deep to avoid the crowd and ended up catching some nice Lake Trout. 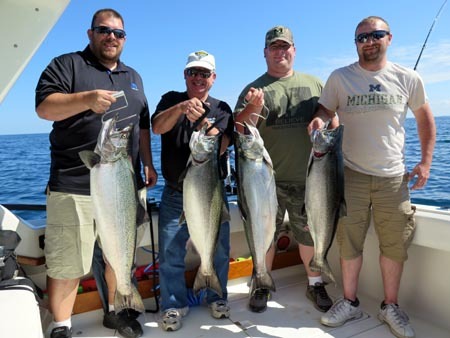 Three of our big ones came on a 10″ Chrome Spin Doctor/Chrome Chartreuse WhirlyGig down 180 ft. on an out down. We took two more Trout on a tin can dodger/Green Chartreuse Spin-N-Glo.